Among Kudadoo’s multitude of leisure activities for you to indulge in is fishing. Often perceived as much more than a sport, the simple pleasure of being out on the open ocean can afford you precious time to reflect or to bond. Whether or not you find your catch noteworthy, you are guaranteed to be rewarded with some mesmerising sights and feel a sense of place together with your friends and family. 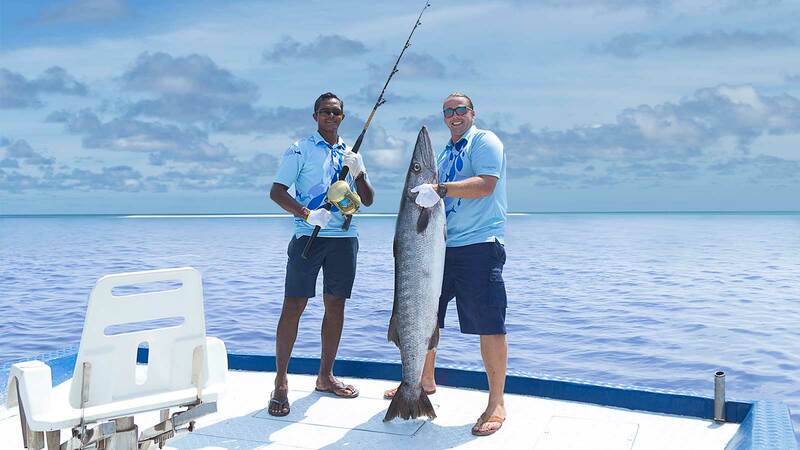 Catch a sight of the atoll’s immense seascapes from onboard Kudadoo’s fishing vessels as you take on the challenge of reeling in tuna, sailfish, barracuda, dorado, wahoo and other trophies. Big game fishing and cast fishing at Kudadoo are conducted in a environamnetally concious manner, minimising any impact on the the ocean’s coral reef environment.